Women returners: Back to your future: Is caregiving as valuable as breadwinning? 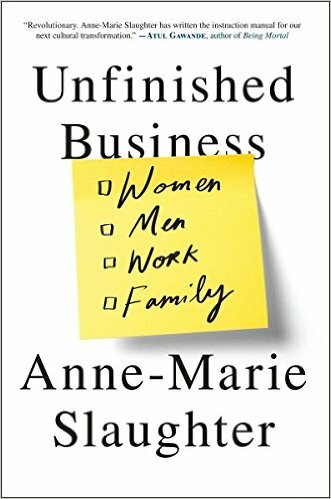 I've been reading Unfinished Business by Anne-Marie Slaughter this week. The book follows on from a controversial article she wrote in 2012 in The Atlantic "Why women still can't have it all". She had left her role as director of Policy Planning at the US State Department to return to an academic career, as she wanted to have more time with her teenage sons. At the time she was criticised for 'dropping out' and betraying her feminist ideas - incredible, considering she was returning to another high-level full-time role. Now Anne-Marie Slaughter has come forward with a big vision - to 'finish the business' of creating equality between men & women, work & family. She sees the key to doing so as changing society and the workplace to value caregiving alongside breadwinning. She suggests that the core problem for gender equality in the workforce is that caregiving has been devalued and discriminated against. Putting aside the debate on feasibility of the societal and workplace changes she is advocating, there is an important message in the book for those who have taken a career break to look after children or other family members. We can, all of us, stand up for care. It's hard to disagree with Anne-Marie Slaughter's statement that caregiving has been devalued. However, as individuals, we don't have to go along with this. As Slaughter puts it: We can, all of us, stand up for care. It's refreshing to have a powerful woman challenging the assumption that the work we do as professionals is harder than the work we do as parents or caregivers. She concludes that caregiving done well 'is just as valuable and formative an experience as competition'. This isn't about valuing one above the other or returning to a world where most mothers stay at home, it's about recognising that family and work are equally important. The work-family choices that people make - working full-time, part-time, at home - should be equally validated and facilitated for both men and women. Slaughter echoes our view that there should be freedom for people to slow down or pause their career for caregiving reasons without stigma or penalty. Admittedly, society and most of the workplace may be lagging far behind in this realisation. But standing up for care is a useful mantra to remember if you find yourself, when you're ready to return to the workforce, feeling embarrassed or apologetic about having taken a long career break. Or feeling a failure or a poor female role model when you compare yourself with ex-colleagues who didn't pause their career and are now in top-level roles. Having the freedom to compete at the highest levels of a career doesn't make it an obligation to do so. The value that you have brought to your family can constitute just as much of a success for this phase of your life.